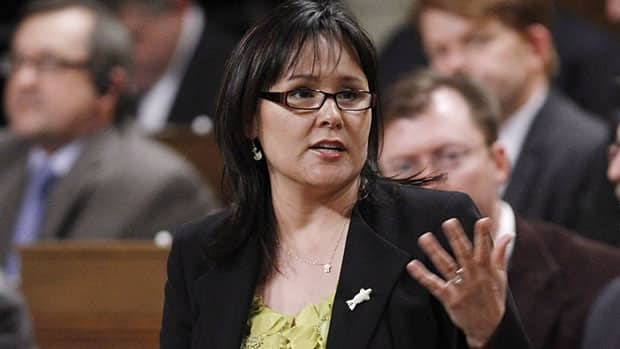 Health minister says UN food official "ill-informed" and "a bit patronizing"
By Laura PaytonA federal cabinet minister slammed activist groups who she says interfere in Inuit traditions, blaming them for food security problems in the North. Health Minister Leona Aglukkaq, who's from a hamlet in Nunavut called Gjoa Haven, met with a UN food security official on Wednesday, but said he didn't understand the real problems faced by the Inuit. She said environmentalists and activists were the problem behind any food insecurity. "He’s ill-informed. I found it a bit patronizing and [just] another academic studying us from afar who's going to make comments about the challenges that we have," Aglukkaq said following her meeting with Olivier De Schutter, the UN special rapporteur on the right to food. Food security, she said, is "about the fights that we have with groups like [the] European Union that want to stop the seal hunt and/or [the] Pew Foundation who wants to put a moratorium on fishing and/or the polar bear activists." "We continue to live off the land, eat the seal meat, eat the polar bear meat and whatnot. And the collective implications of environmentalists, activists, whether it be the fish plus the seal plus the bear, leaves very little for us as Inuit and Aboriginal people of Canada’s Arctic with very little to eat." Olivier De Schutter (left) came to Canada to investigate the facts about the affordability and accessibility of nutritious food for all Canadians. (Don’t be fooled: it was primarily about Inuit, First Nations and Métis people.) His conclusion? Access and affordability just aren’t there. De Schutter says northerners can’t afford nutritious food. The federal government’s subsidy program for exorbitantly priced staples—flour, butter or lard, sugar—is inadequate. All the more so in light of the fact that so much personal income must be spent on housing, heating and transportation (the latter for healthcare, among other things). The UN envoy suggested Ottawa might want to consult northerners to find out what might be more appropriate as a subsidy. He noted northerners are having an increasingly hard time feeding themselves with local goods because the high price of fuel—and climate change—mean traveling farther afield to get those caribou or seals. But what she did not deny was the fact that, for northerners, nutritious food is a luxury. Hard to get access to. Out of reach for many. Good thing. Because, as Minister for all Canadians in the entire Canadian north, she wouldn’t be telling the truth if she flatly denied there was a problem.Comment: Cadrain notes that De Schutter was criticizing the situation across Canada's north--not just in Inuit communities. Aglukkaq apparently had nothing to say about Natives and others who don't practice a traditional lifestyle and can't afford food. That's just one response to Aglukkaq's position. We can see how silly her position is by looking at the overall picture. There are poor Native communities across North America. Most don't want to return to a traditional lifestyle of hunting and foraging. Moreover, the landscape has changed and they don't have the skills and resources, so they couldn't if they wanted to. And innumerable laws and regulations would prevent a largescale return to hunting and foraging. So the problem in most places isn't environmentalists and other activists. It's a long history of broken treaties and failed government policies. Especially the lack of money to fund necessary government services. Is Aglukkaq gonna blame activists for the hunger and poverty that exists everywhere? Or are the northern Inuit communities an exception? Does she believe activists are the problem there but government stinginess is the problem everywhere else? If so, she didn't say that. She didn't tell De Schutter, "You're right about everything except the Inuit communities where activists are to blame." Which renders her comments suspect if not flat-out wrong. As Cadrain suggests, she was blaming the messenger for the message. She was trying to shift the blame from her conservative government to someone else. Too bad her motives are so transparently obvious. For more on the subject, see Inuk Minister Cuts Aboriginal Services and The Aboriginal Sarah Palin?